The first time a Grand Lodge session was held in Waco was 1857. 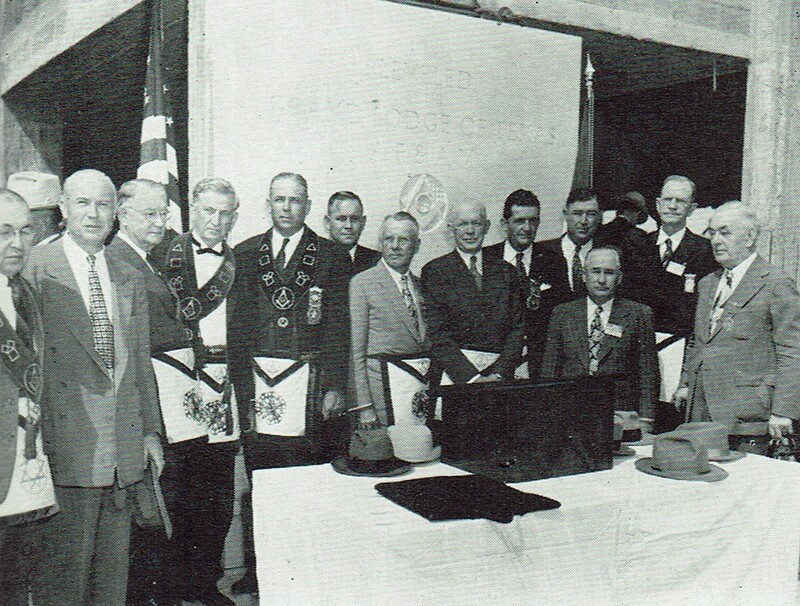 Waco 92 members such as the legendary Joseph Speight and early Texas doctor William Oakes were on the hosting committee and the event was so successful that it became a lodge goal to bring the Grand Lodge back to town. No doubt one of the things that had bolstered our case for hosting the session that year was our creation of the Waco Masonic Institute, a college for men and women that would evolve over the years and eventually became TCU, now located in Fort Worth. Another major factor must have been the presence of the aforementioned Brother Speight, who was Grand Master of Mississippi prior to moving to Waco and becoming Master of Waco 92. 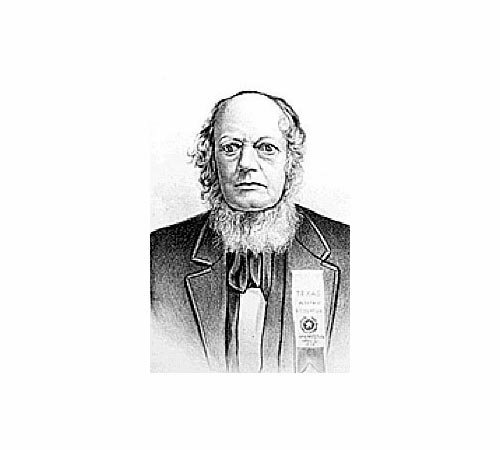 Speight mentored such Texas masonic legends as John B. Jones and was a major influence in regularizing the esoteric work based on how it had been done in Mississippi. Waco 92’s nationally known building downtown on the Square. 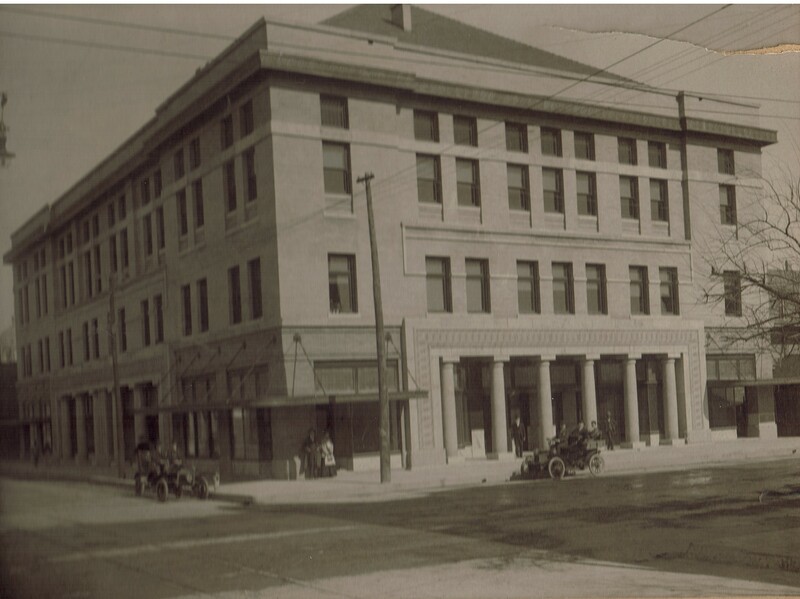 It burned down in 1907.
building down on the Square was nationally famous and our members managed to pool together a modern day equivalent of $300,000 and a program that carefully detailed how Waco would make the most sense geographically and economically as the headquarters for Texas Masonry. Worshipful Master Strayhorn appointed Brother Jesse McLendon as delegate to nominate Waco at the Grand Lodge special session. Our own Brother William Winthrop Seley(founder of the Red Cross in Texas) donated land at the corner of Franklin and 6th street where the first Grand Lodge Temple in Waco was erected. That building was designed on commission from Waco 92 by a Past Master of Tannehill Lodge #52, James Flanders. We have several photos of that building but the most interesting one shows it right after completion(photo shown below). On the 6th street side of the building, Brothers M.T. Bell and John Strayhorn sit in Bell’s automobile at the curb. Bell was a well-known car enthusiast and participated in many central Texas races in those early years. On the Franklin Avenue side, there is Brother W.W. Seley sitting in his own car. The two vehicles were, at the time, the only cars owned in McLennan County. 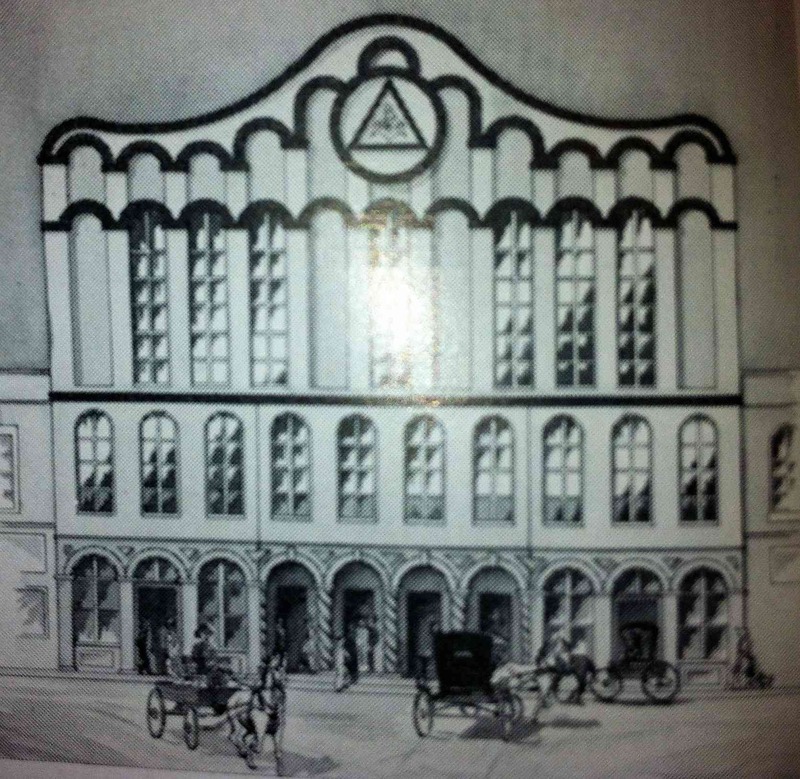 The Grand Lodge moved to that building from Houston officially on December 6, 1904. Grand Lodge continued meeting there for forty-three years. The cornerstone was formally put in place in 1906 and many masons were witness but only one, our Past Master Edwin Street, was also present at the revealing of its contents in 1960. When Waco 92’s own building burned in 1909, we met in the Grand Lodge Temple we’d made possible for a couple years until we finished a new one for Waco Masonry on the corner of 8th and Washington. Soon, we gave the Karem Shrine a loan so that they could construct a Shrine building nearby on Washington Avenue. Both of those buildings remain but that first Grand Lodge down on 6th and Franklin is long gone. In its place now stands a parking garage for Waco ISD. After our Past Master Alva Bryan served as Grand Master in 1932(he was the first to be elected unanimously for the Grand South), he was selected to head the Centennial Committee charged with preparing various celebrations of the first one hundred years of Masonry in Texas. 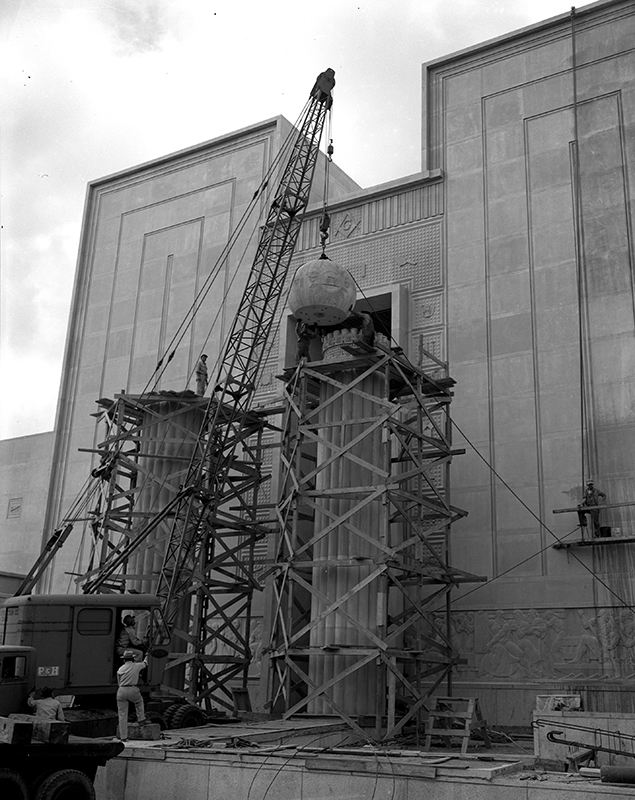 Many projects were undertaken by the committee but the most important was the beginning stages of erecting a new Grand Lodge Temple. As this was in the middle of the Great Depression, the project was no small task and eventually took more than a decade to complete. Finally, in April and May of 1945, enough funds had been raised to start moving forward with the plans for the new Temple. Our Past Masters Alva Bryan, George Zimmerman, and William Quebe led the site-purchasing committee. Together, they selected a block of ground at 7th and Columbus and purchased it for $75,000. The location was no mistake. It eventually made Waco 92 the only lodge from which one could see the Grand Lodge Temple from the lodge room as the only thing between our lodge at 8th and Washington and the new Grand Lodge site on Columbus was the Karem Shrine building for which Waco 92 provided the funds some twenty years earlier. After selecting and purchasing the site on Columbus, fundraising for the construction was flooded by members of the lodge and in addition, the lodge itself gave $2,500. Then Grand Master Bascom Giles made a special visit to Waco 92 to thank the lodge members for their efforts in making the new Temple possible. At that meeting, the brethren voted to purchase a Spanish Live Oak tree in memory of our fallen brothers of WWII to be planted on the new Grand Lodge grounds. From 1939 to 1945, it is likely that more freemasons died prematurely than during any other six year period in history. There were two main reasons: up to 200,000 were killed as targets of the Nazis during the Holocast and countless others never returned home from the War while fighting the Nazis. 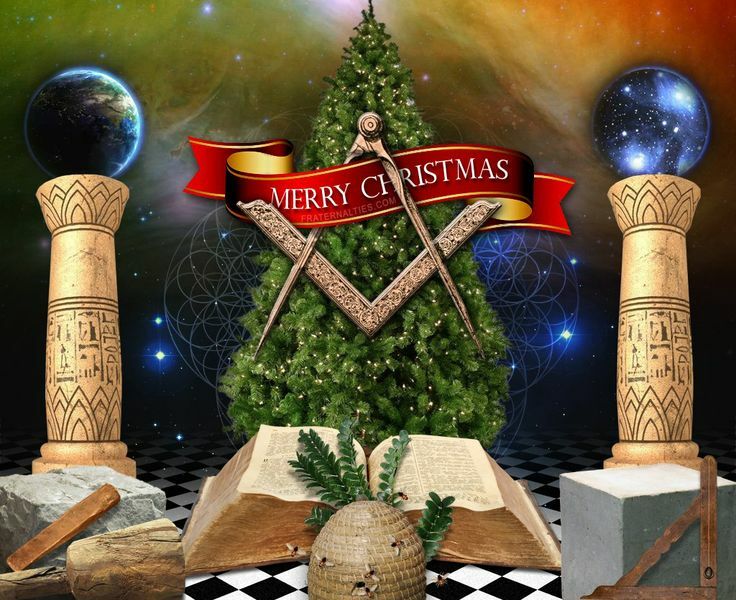 It is likely that this sad reality inspired our lodge members to purchase the tree and that at least partially led to the entire Temple being dedicated to Masons who never came home from the War. With this new inspiration came new vigor for construction. As plans came together to start building the Temple, our own Pat Neff was serving as Grand Master of Texas. 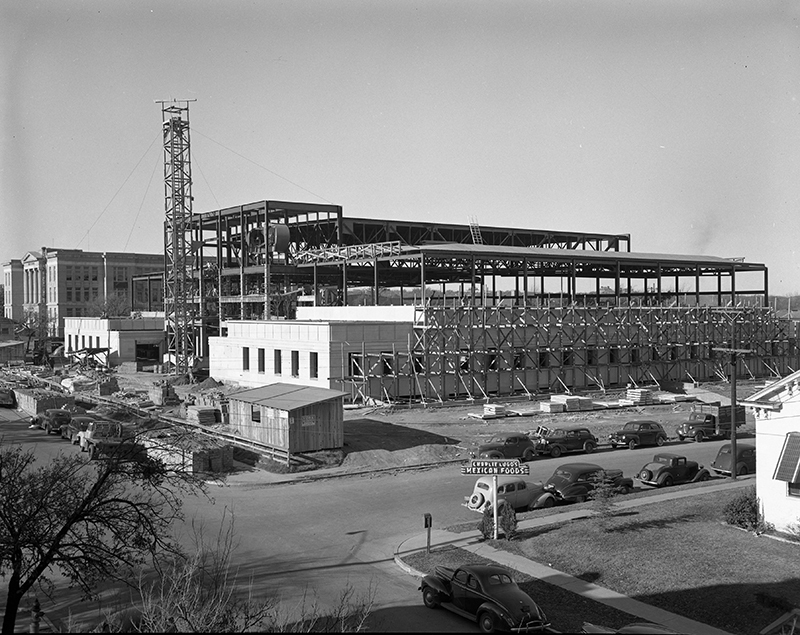 A couple more years of planning allowed construction to finally start in 1948. Our minutes from September of that year show we donated a significant amount of money to help District 1 purchase an electronic pipe organ for the new Temple in memory of Past Grand Master Sam Cantey. 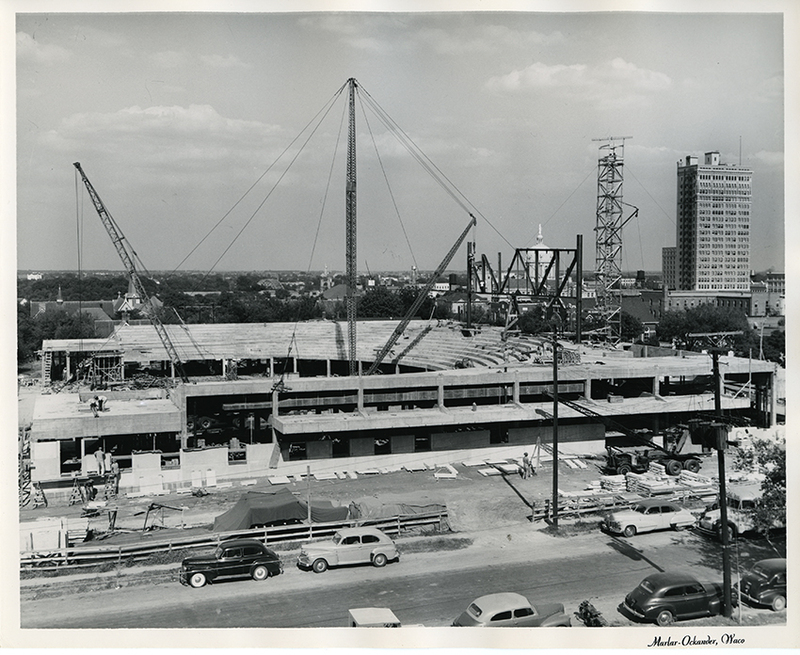 On December 23, 1947, a groundbreaking ceremony for the new Grand Lodge Temple took place and the first meeting of the Grand Lodge of Texas in its new building took place in December of 1949. In total, the Temple had cost Texas Masons two million dollars. Our Past Master Earle Hooks became tour guide for the public to explain the various artifacts and architectural details throughout the building. Past Master Leonard Studer served as one of the first Grand Secretaries in the new building and then for 18 years as Grand Treasurer. As it stands today, the Grand Lodge Memorial Temple is one of the world’s most incredible masonic structures. It is becoming common for Grand Lodge jurisdiction’s to sell their primary building and move about, sadly leaving behind a history of great architectural advances in American style. For now, Texas Masons boast a beautiful Grand Lodge building. Waco 92 is fortunate to have been extremely influential in making that Temple possible. As it is one of the more famous masonic structures, Waco 92 is especially fortunate in that we have ties to TWO of the world’s best masonic buidings, the Grand Lodge Masonic Memorial Temple in Waco and the Washington Masonic Memorial in Virginia which was dedicated by our own Alva Bryan in 1932. Made to resemble King Solomon’s Temple, the building is 249 feet and 4 inches wide by 226 feet and 8 inches long with a maximum height of 88 feet. Three, five, and seven steps were made to reach the main doorway. They pass between the two large pillars for which the building is often recognized. These pillars have a circumference of 20.612 feet and a diameter of 6.561 feet. Their overall height is measured at 39.506 feet. 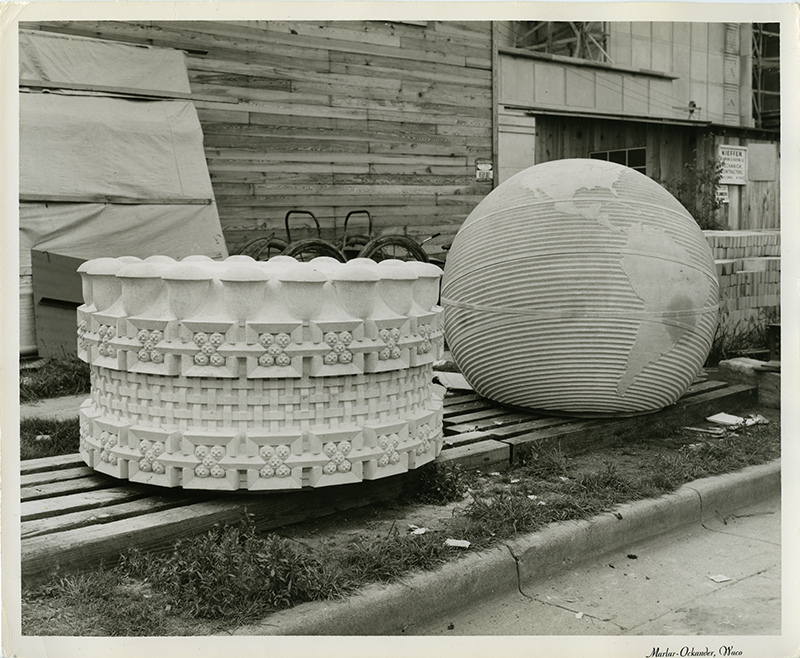 The globes atop them are 8.583 feet in diameter. The left globe is Terrestrial with the Ecliptic set horizontally. The right is Celestial with the celestial bodies oriented appropriately to the Terrestrial globe. In this way, the right globe is set to match what one would see if one were looking at it from the left globe. For example, the Zodiacal Belt is horizontal because it follows the Ecliptic. The Sun is to the right and the Moon faces Columbus Avenue. The Moon is a half moon. The main doorway is framed with various masonic symbols. Its height is 61 feet and its width is 27 feet. The door itself is 14 feet, 4 inches wide and 46 feet tall. The doors are stainless steel, framed with bronzes and bear the brazen seal of the Grand Lodge of Texas. Above them is a stained glass window that is 33 feet high. Bronze framing separate the 21 panels of the window it depicts the meeting that happened in March, 1835 at the Masonic Oak in Brazoria. The doorway has two 77 feet high towers on each side. At the bottom of each tower is a sculptured frieze. Each one is 35.5 feet long and 6 feet, 8 inches tall. The left frieze shows fifteen ancient craftsmen cutting, squaring, numbering, transporting, and setting the stones used in King Solomon’s Temple. The right shows fifteen ancient craftsmen felling, hewing, transporting, and setting the lumber that was used in the Temple. This accounts for the exterior of the structure. As marvelous as it is, one cannot imagine the magnificence of its interior. From the large stained glass window above the Memorial Room(this was relocated from the original Temple at 6th and Franklin) to the wide-ranging contents of Library and Museum, an entire day in the Grand Lodge could merely scratch the surface of seeing its wondrous collection and the beautiful architecture that holds it. Recently, much of the building has been undergoing renovations. For that reason, it is currently closed to the public but it is expected to re-open in February of 2017 and all are invited to come and see the Grand Lodge of Texas Library and Museum. Glad you enjoyed it, Rusty! Well done brother, great info. Thanks so much for this article about the History of the Grand Lodge in Texas. Thanks, Brother Germany! I’m glad you liked it.